ARLINGTON, VA – March 1, 2018 – Education technology leader Hobsons announced today that its Naviance platform has been selected by Ann Arbor Public Schools in Michigan to provide all students with greater access to college and career readiness tools. The district-wide implementation of Naviance, which is used by 40 percent of high school students nationwide, comes as part of Ann Arbor Public Schools’ recent initiatives to improve equity and access for all students, with special emphasis on underserved populations and students from low-income families. One of the highest-achieving districts in Michigan, Ann Arbor Public Schools currently sees college enrollment rates of 79 percent and four-year college graduation rates of 90 percent. Although the district is already well above the national and state averages, AAPS Superintendent Dr. Jeanice Swift has committed to increasing achievement levels for all students, with a focus on eliminating the achievement gap for students from underrepresented populations including English as a Second Language students and low-income, special education, and minorities. Ann Arbor Public Schools serves a student population of more than 18,000 students. Naviance will allow the district to effectively scale existing counseling services to best meet the needs of the entire student population and to increase its college-going culture. 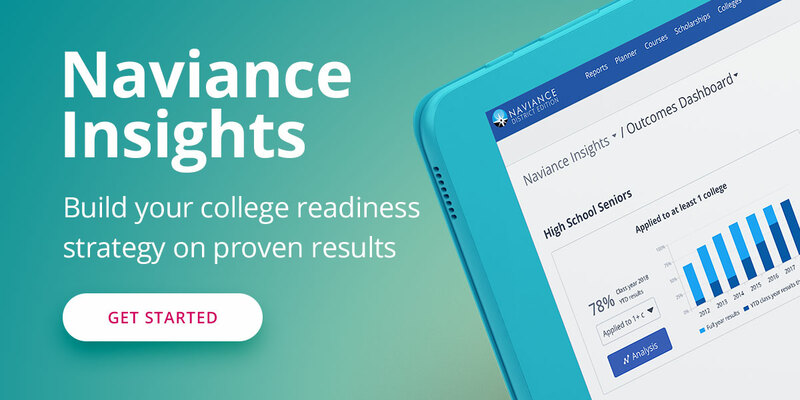 Available to all students, their families, and school counselors as of fall 2017, Naviance will help students to identify their strengths and interests, connect those interests to potential careers, and plan an education strategy to reach their goals. The platform allows students to explore multiple pathways to success after high school, whether they are heading directly to a two- or four-year college or plan to enter the workforce, join the military, or pursue another path. Naviance provides information and resources that enable counselors, faculty, students, and parents to engage in meaningful conversations about how to assess a student’s options after high school, and to explore a postsecondary path that is the best fit for the student, based on individualized education and career goals, learning styles, and personal preferences. The platform also equips students and their families with information on the true cost of particular colleges, based on their own family income, and allows them to explore scholarship and financial aid opportunities. Naviance is used by more than 13,000 schools and districts in the United States, including half of the country’s top 10 largest public school districts. To learn more about Naviance, visit https://www.naviance.com/. Naviance by Hobsons is the world’s leading college and career readiness platform that helps more than 13,000 K-12 schools and districts to align student strengths and interest to postsecondary goals, improving outcomes and launching students on a path to succeed after high school, whether their next step is a 4-year university, 2-year community college, trade school, the military, or directly into the workforce. Naviance is recognized as the 2017 SIIA CODIE Award winner for Best College and Career Readiness Solution.